An Orbital ATK Antares rocket stands atop Pad 0A at NASA's Wallops Flight Facility on Wallops Island, Virginia during an attempted launch on Nov. 11, 2017. The launch was aborted at the last minute due to a wayward plane in the mission's restricted airspace. WALLOPS ISLAND, Va. — A cargo resupply mission scheduled to launch to the International Space Station this morning (Nov. 11) was aborted at the last minute due to aircraft flying in the restricted airspace over the launch site at NASA's Wallops Flight Facility here in Wallops Island, Virginia. Orbital ATK's Antares rocket was one minute away from liftoff when flight controllers abruptly aborted the launch at 7:36 a.m. EST (1236 GMT), when the aircraft entered the restricted area. With the five-minute launch window closed for the day, Orbital ATK rescheduled the Antares launch for no earlier than 7:14 a.m. EST (1214 GMT) on Sunday (Nov. 12). You can watch the launch live on Space.com beginning and 6:45 a.m. EST (1145 GMT) . 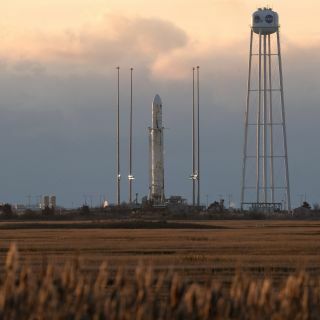 "The launch of Orbital ATK’s Antares rocket carrying the Cygnus cargo spacecraft has scrubbed for Saturday after an aircraft was detected in the vicinity of the launch pad," NASA officials said in a statement. In a post-abort briefing at the Wallops Flight Facility Visitor Center this morning, Orbital ATK officials said the Federal Aviation Administration (FAA) has determined that a small personal aircraft entered the restricted airspace while flying about 6 miles (10 kilometers) offshore at an altitude of approximately 500 feet (150 meters). It is not yet clear how the aircraft managed to escape detection until the last minute before launch, Orbital ATK officials said. The FAA issues notices to aviators about airspace restrictions well in advance before rocket launches. At this time, Orbital ATK does not know who was piloting the aircraft in question, but the FAA is investigating the incident. Around 3,500 spectators had gathered at the visitor center here at NASA's Wallops Flight Facility to view the launch in freezing-cold temperatures, some arriving more than four hours in advance to secure the best viewing spots. When flight controllers announced that today's launch would not continue, the crowd of shivering and baffled onlookers packed up their chairs and blankets and left. Young children cried as their parents had to explain why they would not get to see a launch today. While some attendees said they planned to return tomorrow for another launch attempt, others who had traveled from out of state said they could not afford the luxury of sticking around an extra day. "A plane? Seriously? I drove six hours just to watch a plane fly over the launchpad," said Michael Vargas, my husband, who had driven to Wallops from Brooklyn, New York overnight to see what he hoped would be his first rocket launch. "I have to head back today to grade school papers, so I can't stick around to see it tomorrow. What a bummer." Another couple from Washington, D.C., Paul and Amy, had driven down here with their middle school-aged children and told Space.com that they planned to stick around for tomorrow's launch attempt. They said that this would be their first launch since NASA's space shuttle days. For their children, this will be their first experience seeing a rocket launch. Antares will launch a Cygnus cargo craft to the International Space Station to deliver more than 7,700 lbs. (3,500 kilograms) of food, supplies and science experiments to the Expedition 53 crew. If the mission had launched according to plan today, Cygnus would be arriving at the space station early Monday morning (Nov. 13). But with today's launch being scrubbed, it will arrive no earlier than Tuesday (Nov. 14). Weather prospects for tomorrow's launch looks promising, with conditions 90 percent favorable for launch. It will also be about ten degrees Fahrenheit warmer than it was this morning, so spectators returning to the launch site tomorrow can count on a less frigid and more pleasant viewing experience. Editor's note: This story was updated at 9:42 a.m. EST to included a revised crowd size for the number of spectactors here at NASA's Wallops Flight Facility. It was updated again at 10:50 a.m. EST with new information about the aircraft, which Orbital ATK officials discussed in a post-abort press conference.